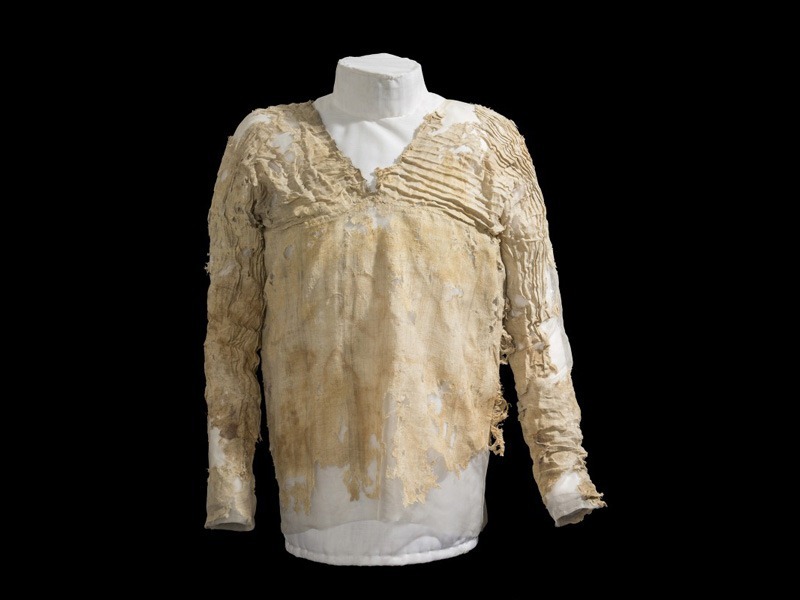 This tattered V-neck linen shirt, currently on display in the UCL Petrie Museum of Egyptian Archaeology, is the world’s oldest woven garment. A recent radiocarbon testing conducted by the University of Oxford has established with 95% accuracy that the dress was made between 3482-3102 BC. While garments of similar age has survived to the present day, but those were simply wrapped or draped around the body. The Tarkhan dress, on the other hand, is a tailored piece with long sleeves, V-neck and narrow pleats, that looks surprisingly modern. The Tarkhan dress was excavated by Egyptologist Flinders Petrie in 1913 from a First Dynasty tomb at Tarkhan, an Egyptian cemetery located 50 km south of Cairo. Petrie had found a quantity of linen cloth under the sand alongside other artifacts. Instead of discarding away the linen as worthless, as most archaeologists at that time did, Petrie decided to preserved everything he found as evidence that would someday help throw light on the daily life of the ancient Egyptians. he bundle of filthy rags Petrie recovered was stored away and forgotten for sixty-five years. It was not until 1977 when conservation experts at the Petrie Museum was sorting through the bundle did they stumble across the garment. 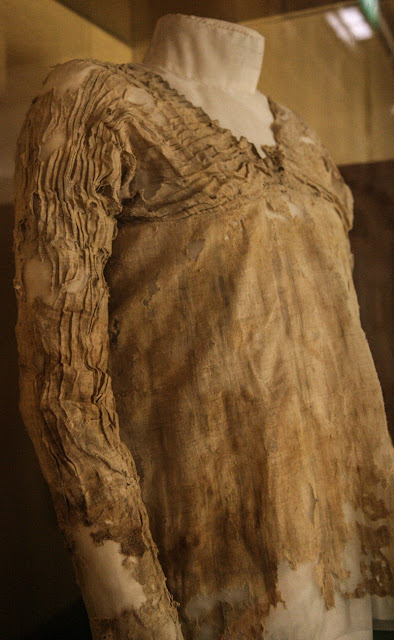 As textile conservator Sheila Landi carefully removed the caked mud from the dress, she was excited to see creases in the sleeves at the elbow and under the arms indicating that the dress had been worn in life. The garment was also found inside-out, as it would be if one were to pull it out over the head. The Tarkhan dress is made from three pieces of sturdy hand-woven linen with a natural pale grey stripe, which complements the neatly knife-pleated sleeves and bodice. The lower part of the dress is missing so it’s difficult to say how the long the dress originally was or whether it was for a man or a woman, but its dimensions indicates that it fitted a young teenager or a slim woman. At the time of its rediscovery in the late seventies, radiocarbon dating was not carried out as it would have required the destruction of a large piece of the dress fabric. Instead of dating the fabric itself, the associated artifacts from the Tarkhan site was dated. Results indicated that the dress belonged to the First Dynasty which began in 3100 BC, making it the world’s earliest example of a woven garment. Advancement in radiocarbon dating has now allowed researchers to date the textile directly by taking a tiny 2.24mg sample of the dress. The new results not only confirm the dress’s antiquity but also suggest that it may be older than previously thought, pre-dating the First Dynasty.